Regardless of whether you have something to celebrate, a glass of champagne is always a good idea. And you don't have to look far in London to find a stylish bar in which to sip fine fizz. Read through this glamorous range of seven options to toast the city's excellent champagne scene, from Europe's longest champagne bar to its highest. The good times definitely roll at this glamorous restaurant in Soho. The interiors evoke the roaring '20s with velvet curtains, lamp lights, and gold trim, and the cozy booths are fitted with "press for champagne" buzzers. The menu features champagne by the glass and bottle, and it's said to serve more champagne than any other restaurant in the United Kingdom. The food menu is an eclectic mix of British and Russian comfort food (borscht, beef Wellington, and vodka-spiked sorbets). Are you heading to Paris by train from St Pancras Station? There's no better way to start the weekend than sipping a glass of something chilled at St Pancras by Searcys, Europe's longest champagne bar. Overlooking the Eurostar train tracks, the bar is a great people-watching spot that serves an impressive selection of champagne by the glass including some British sparkling wines. Grab a seat in one of the leather banquettes that feature Art Deco lamps and "press for champagne" buttons. There are blankets and heaters on hand for when the station gets a little chilly. Sip champagne in a glittering setting that has played host to iconic Brits including The Beatles, David Bowie, Elizabeth Taylor, and the bar's namesake, Oscar Wilde who is said to have hallucinated on absinthe in this very room. The opulent interiors hark back to a bygone era with ceiling frescos, red drapes, and gilded mirrors, and the champagne takes center stage on the drinks list. Pick from a curated selection from celebrated champagne houses such as Veuve Clicquot and Champagne Henri Giraud. Or pair a glass of fizz with the award-winning afternoon tea, served daily. While red wine is seen as the ultimate cheese partner, champagne is a great alternative. It's light so it won't overpower a subtle cheese but it has enough acidity to cut through potent varieties. At Champagne + Fromage in Covent Garden, you can test out a range of fine French cheeses and champagne from independent producers spanning styles including Classic Brut, Grand Cru, and Demi-Sec. There are weekly champagnes served by the glass and a whole host of cheesy dishes such as baked camembert, fondue, and artisanal cheese boards. Look out for the regular champagne and cheese tasting events at the Covent Garden branch. There are also outposts in Brixton, Greenwich, and Elephant & Castle. This sophisticated Art Deco spot serves an impressive array of rare and vintage champagnes by the bottle and glass. Sink into one of the stylish armchairs at Claridge's Bar, or perch on a red leather stool at the marble bar. For a more intimate affair, check out the hotel's Fumoir, which is a secret drinking den with room for just 36 people. It's a favorite haunt of glamorous stars including Kate Moss and Dita Von Teese. This elegant drinking den has been the hotel bar of choice for famous faces including Frank Sinatra and Marilyn Monroe since it opened in 1889. Drinks are served by smart waiters in jackets and ties and a pianist plays every night on a baby grand. 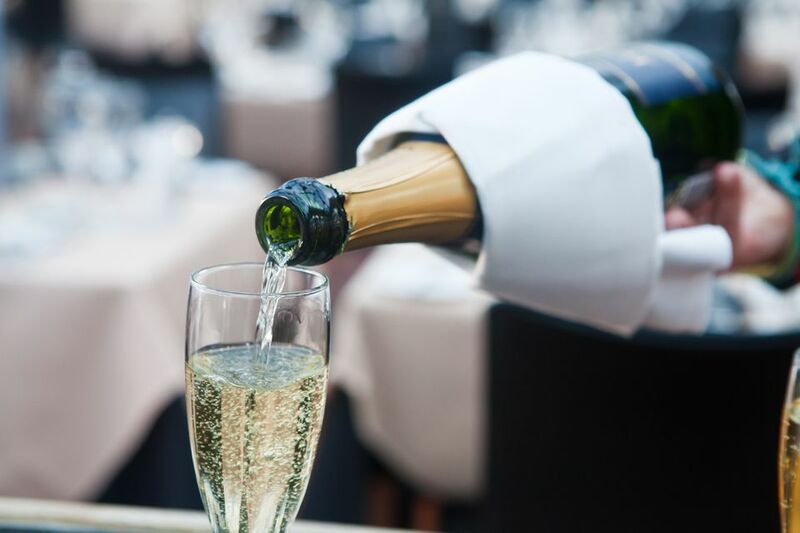 The champagne may be pricey but you'll be sipping quality bubbles from champagne houses such as Louis Roederer, Ruinart, and Dom Perignon and all drinks are served with complimentary savory snacks. Where better to toast London's champagne scene than at the city's highest bar. Up on the 52nd floor of The Shard, Gong sits almost 600 feet above ground level and is officially the tallest hotel bar in Western Europe. The views are jaw dropping and encompass iconic landmarks such as St Paul's Cathedral, Tower Bridge, and Canary Wharf. There's a dedicated champagne bar where you can work your way through a range of classic champagnes served by the glass or bottle, or try one of the champagne cocktails inspired by iconic films.